Call it coincidence, but last month I started researching free online and paid typing programs for kids, specifically for my 5 and 7 year old. One week later, WeAreTeachers and Typtastic, a program for teaching kids how to type, reached out to me to review and share about the program with you! As I browsed the new kids typing site, I felt like this learn to type program was created just for my kids. It was kid friendly with bright colored, fun games, easy to navigate and well organized. In fact, I couldn’t wait to begin teaching my children how to type faster and more efficiently. Note: this article is sponsored. All opinions are 100% my own. Truthfully, when my daughter’s first typing assignment came home, I felt a little blindsided. She needed to have her 5 paragraph research project turned in TYPED – in fourth grade. Yes. Double spaced, size 14 font with each paragraph indented. We hadn’t done any typing before. None. Nada. No typing ever. In fact, I’m a little anti-screen time, so my kids don’t play games or search the internet, meaning, no typing skills. She hunt and pecked the entire 3 pages. I “may” have offered to type it for her, but she was determined to do it herself. Let’s just sum the typing experience with – tears were shed by all. Sadly, now entering middle school, she still is a very slow typer. For the most part, I’m usually a pretty with-it parent. Hey, the kids are fed, clean clothes, and lots of playtime outside. They love to read and write books. We even go to the library once a week. But when it came to typing, I was definitely falling behind. I didn’t realize that our kids are expected to know how to type! I remember learning to type at school, but maybe it wasn’t until middle school. (I’m old, so the memory is a little fuzzy) When my seven year old came home this week from school with a spelling assignment to make his own word search – which he wanted to do on the computer- I knew it was time to start teaching him some typing skills. NOW! He would type a letter, then spend time looking for the next. “Where is the p mom?” he would ask. Thankfully, I was introduced to TypeTastic at the perfect time! When do Grade Schoolers Use Typing Skills? Teaching kids how to type with TypeTastic! After observing classrooms and listening to kids and teachers, TypeTastic! was created. It is a new program of typing games that focuses on a kids narrower eye-span, shorter fingers and developing fine motor skills. 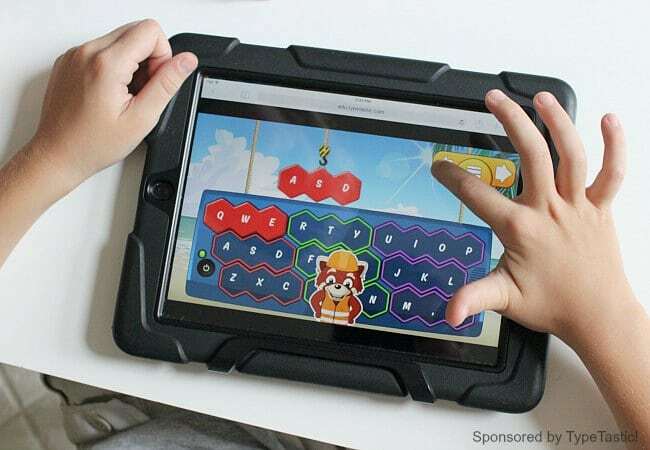 Unlike traditional programs that have kids use all ten fingers and rely on copying words or sentences to memorize where the keys are, TypeTastic! Uses nine color-coded groups. These groupings make it easier for kids to memorize where the keys are. The games work on teaching kids to use one finger and gradually add in more as skills progress . Games that build upon previous knowledge. Begins with one finger, then adds on. 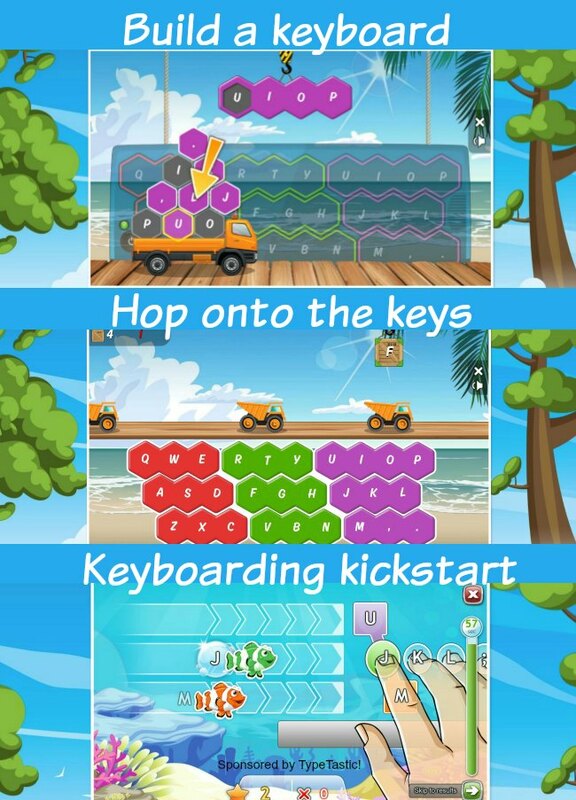 Includes games like AstroBubbles and Ducky Trouble, that help make keyboarding learning fun! Works both on computers and tablets (external keyboard optional). No installing, plugins or updates ever! Kids begin by building a keyboard to gain a better understanding of where the letters are. (See learn to type game pictured above) Then, they move to Frog Pond Patrol game to learn how to use the movements to find the correct keys. Afterwards, they try out their memory of where the letter keys are with the Cupcake bugs learn to type game. After basic mastery, children will move onto games that encourage practice tapping the keyboard, typing words and sentences fluently. 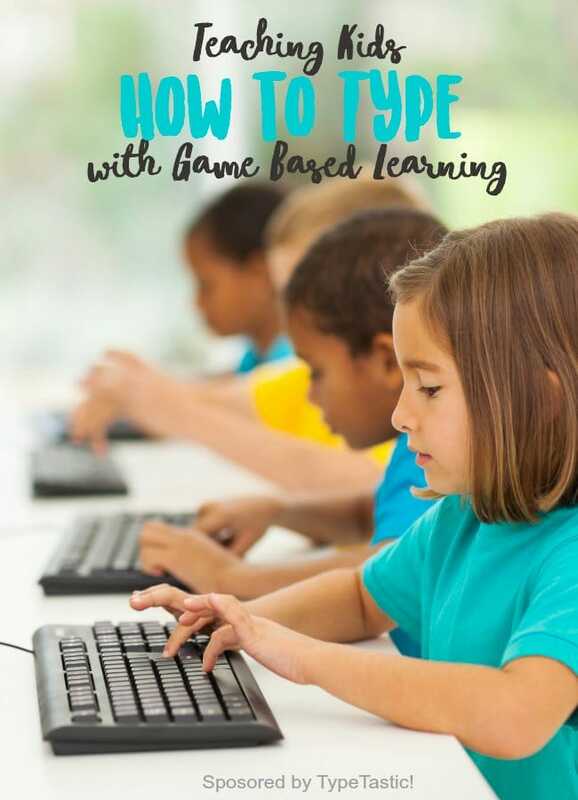 After just 20 minutes of learning to type with game based learning using TypeTastic!, I visually saw an improvement in speed and confidence with my son’s typing abilities. AND – my almost 5 year old is begging to play the typing games too! Use your newly acquired typing skills to practice spelling words in a fun way. Here’s one idea for your grade schooler to try. Great news – TypeTastic! is now Free for Schools! Teachers and parents can simply sign up to have access to the free, ad-free version! TypeTastic! is free for the 2017-2018 school year and the foreseeable future! After the trial, it’s up to the teacher to decide if they want to pay a small subscription fee or keep going for free by switching to an ad-sponsored mode. So how can you use TypeTastic! To teach students typing skills? Schedule time in the computer lab! Use TypTastic! to practice keyboarding skills the next time you take your class to the computer lab. Add TypeTastic! to your technology station. Rotate your small groups through the typing games during small group literacy instruction. Dont forget, TypeTastic! works on Tablets too. Speedy finishers? Encourage students to practice their typing skills when their classwork has been completed. Let parents know they can help practice typing at home. Add in a blurb about the learning games to teach typing into your weekly newsletter. Have a class website? Leave parents a link to TypeTastic!. Sign up HERE for your ad-free access to TypeTastic! “TypeTastic! belongs into a typing game family developed by Typing Master Inc. The company goes back all the way to the 80’s when two schoolboys started coding and selling a 10 finger typing program. The company took an international approach in the 90’s, and today, every month over 4 million people use our typing apps and services in over 160 countries. For more fun ways to learn? Check out our book, 100 Fun and Easy Learning Games for Kids. Teach reading, writing, math and more! Keyboarding is such an important skill for this generation!! Great ideas to making learning this fun! I teach keyboarding in a computer lab to kids in grades k-5. This will be great to use with my younger students!